Trailhead and parking area are on Rt. 101 in Peterborough, NH, 2.8 miles east of Rt. 123 and 1.8 miles west of Rt. 45. There is a small parking fee. Pack Monadnock, located in Miller State Park, is one of the sixteen New Hampshire mountains with an active fire tower. An auto road leads to the top of the mountain, but there are also hiking trails to climb. There are two routes up the mountain: the Wapack Trail and Marion Davis Trail. Although they are the same distance and have the same elevation gain, the Wapack Trail is much more difficult because of its rocky trail surface. Both run parallel to the auto road at a distance. You can make a loop out of both trails, but we recommend the out-and-back hike on the Marion Davis Trail. From the parking area, head up the trail at the far right corner of the parking area to the kiosk and fork right onto Marion Davis Trail. It is gradual and not too rocky. The trail climbs easily across the slope for the first 0.8 miles. After passing beneath a tall rock ledge, the trail turns uphill and climbs more steeply for half a mile to the top. At the summit of Pack Monadnock, there is a parking lot for the auto road, some communications towers, various buildings, and the fire tower. From the fire tower, the view is excellent. To the north is North Pack Monadnock, the Belknap Range, and the White Mountains, among others. Mt. Monadnock is seen to the west, Boston to the southeast, and some Massachusetts ski areas to the south. 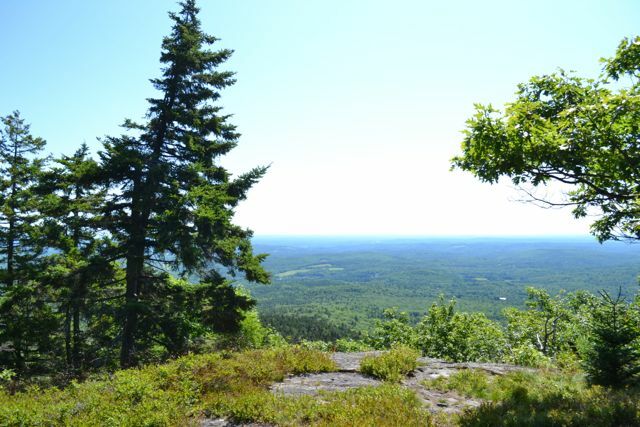 After enjoying the view from the fire tower, head over to the Boston view clearing (near where you came up) and pick up The Nature Conservancy's 1/4-mile Spruce Knoll Trail, which begins on the left side, just out of sight. Spruce Knoll is a seldom visited viewpoint and is perfect if you want to enjoy the view alone. On the way, you will walk through a beautiful spruce forest. For a different (but busy) viewpoint, walk down to the Audubon Raptor Viewing Area, where there are picnic tables.